Project obstacles and solutions: Section 5 of the I-69 expansion through Bloomington, Indiana follows the current route of State Route 37. The project calls for the present highway to be widened to accommodate a larger median that meets the Federal Highway Administration regulations for interstate design. Force Construction was awarded the contract to build or upgrade 28 bridges from the south side of Bloomington to College Avenue while keeping the highway open. Anytime you are taking on a job of this magnitude through a metropolitan area, there are many factors that play one against the other. One bridge has to be completed and opened before another can be shut down. A delay in construction can cause an alternative route to experience heavy traffic over an extended period of time, which can cause extra strain on the pavement. In this case, Force Construction experienced a number of delays as the new abutments and piers were being set back off the original highway. The stony soil was challenging and required engineering adjustments as the caisson shafts were being drilled. These delays caused parts of the current highway to break down, especially along the shoulders where heavy truck traffic was causing damage. This required patching during the slow-traffic night hours. IMI opened concrete plants at midnight to accommodate these hours. The bridges were poured at all hours to make up time on the construction schedule. 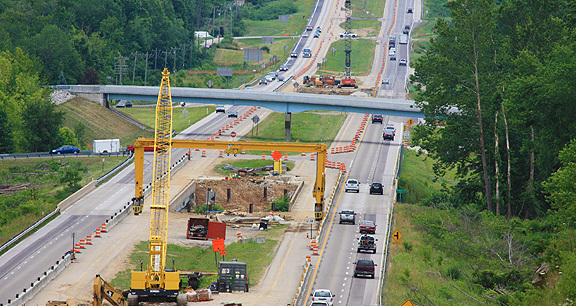 The extension of I-69 throughout Indiana is scheduled to be completed by July 2017. For more information on ways to speed up concrete pours, contact the sales representative at the concrete plant nearest your location. Click here.